You have got to try the Panforte ice cream! It is my favorite so far. And you're right. I haven't bought store bought ice cream since buying my ice cream machine and this book. I have made a few recipes (I want to make more, but need to limit myself!!) Out of the ones you'd made, I'd also made vanilla (French style) and Green Tea. Loved both! Not usually a vanilla person (would eat it, but not a favorite) until I had this one! I'd always loved green tea ice cream, and some ready-made ones were terrible. So I'm glad I am able to make my own now. I need to try some of the more unusual ones! I am dying to have me some green tea ice cream. I ate it a while back at a Japanese restaurant, and I absolutely fell in love with the flavor. Problem is I can't seem to find it in stores around where I live. Maybe I should invest in an ice cream machine. Marg, ice cream makers are not that expensive and oh so easy to use. I think the one my husband bought me for my birthday a couple years ago was only $40 and we've gotten TONS of use out of it. The key is to always keep the container in the freezer so when the mood strikes you to make ice cream, it's ready to go. Otherwise, you're going to have to wait 24 hours for it to freeze before you can put the ice cream base in the container to freeze. I have always wanted to buy an ice cream maker, but was afraid the ice cream just wouldn't turn out right. You have now convinced me to go ahead just so I can get this great book! @TheBookGirl DO IT! Making your own ice cream is so easy and so much better than anything you'll get in a grocery store. Olive oil ice cream is FANTASTIC! We automatically think olive oil is only for savory applications, but EVOO is actually quite fruity. When you combine it with milk and sugar, it has a lovely mild flavor. Yum! I *love* green tea ice cream, and if I knew how to make it at home I too would never again go store-bought. The Aztec "hot" chocolate also sounds awesome - I love spicy chocolate. 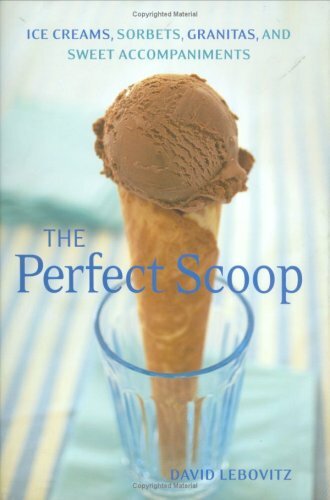 I had not checked out this book-I love making my own ice cream-although I must say, fruit flavors are my favorite in the summertime. I am always looking for another ice cream book so I will need to check this one out. I have a gelato book I bought in Italy years ago-however translating is always a deterrant to pulling it out on the spot. I shouldn't be, but I'm surprised at the wide variety of flavors you've mentioned here for ice cream. This is way beyond the 39 at Baskin Robins. I'm intrigued enough to see if my library has a copy. Your green tea ice cream looks delicious. It's such a great cookbook, I need to get out the ice cream maker already! The matcha ice cream looks so good! I love the color. This sounds like such a deletable cookbook! All the flavors sound so unusual but Roquefort honey ice cream is a flavor that I'd like to try as I can't even begin to imagine what it tastes like. This is my first time joining in Beth's event ..I am really enjoying it! Oooohh. My Weekend Cooking post this week is about ice cream to, but I only am reading about it, not actually making it! I'm a great fan of David Lebovitz's blog. I've been thinking about this book for a while. I'm sure I should buy it. Goats cheese ice cream sounds amazing. Thanks for the recommendation! I will have to get this one for myself as well as anyone else I know who has an ice cream maker. This would also make a great wedding present (along with an ice cream maker). Oh I need to get this book -- I have copied some of his recipes from the Internet, but I think I need to have an entire book! Mmmm...Aztec hot chocolate sounds delicious. I love chocolate ice cream, as long as it has something more than just chocolate in it. I love this cookbook. All that heavy cream in the recipes is dangerous, however!